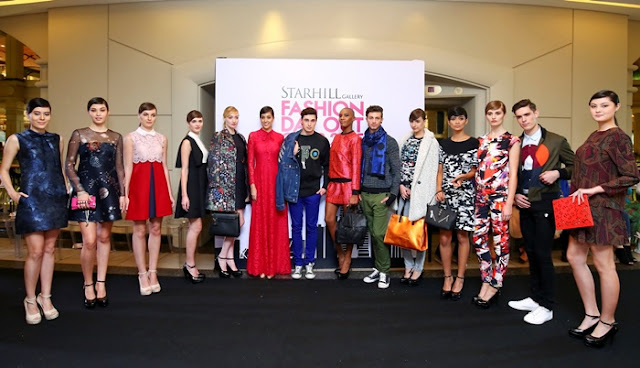 Here for a stylish affair at the Starhill Gallery Fashion Day Out 2015 showcase the latest trends of 2015’s Autumn / Winter collections of Starhill Gallery’s exclusive designer labels such as Kenzo, Valentino, McQ Alexander McQueen, M Missoni, Khoon Hooi, Mita Tam Style Studio, Debenhams and iKarrtini. The stylishly breathtaking garments, contemporary trends and the most up-to-date accessories; with graphic black and white, folksy tribal elements and an 80s comeback, the continuation of a 70s summer tells a story of multiple influences for Autumn/Winter 2015 in a celebration of personal style displayed. The fashion showcase was spread throughout three floors; Indulge, Adorn and Explore Floors each with its own thematic experience. Indulge Floor or the Elegant Luxury level showcased leading fashion labels Valentino and Kenzo. For Valentino’s Autumn/Winter 2015 collection, haute couture, modern and opulent sensuality is expressed through floral prints and butterfly motifs with luminous touches through raised metallic threads and binary contrasts of stripes, triangles and geometric shapes. Kenzo's Autumn/Winter 2015 collection depicts togetherness through camaraderie, ceremony and protection. The collection looks towards individuality, survival, protection and functionality. The Adorn Floor or the Hip Luxury floor showcased collections from M Missoni, MCQ Alexander McQueen and Khoon Hooi. The mood pervading for M Missoni Autumn/Winter 2015 collection is that of intrigue and enchantment, where material mixes play an essential role. Materials are chunky, rich with full textures and knits that come complete with ripple or degrade effect. MCQ Alexander McQueen Autumn / Winter 2015 reflects the chaos of metropolitan life. The stimuli behind the collection are as diverse as the clothes themselves, reflecting elements of the historic, the ethnographic and the technical – all seen through the lens of contemporary youth culture. This season, Khoon Hooi has incorporated autumn elements such as the maple leaf and purple and orange colours of the sky into the collection. The materials have been carefully chosen to encapsulate the momentary feeling of marvelling beauty such as how Mongolian fur and delicate ostrich feathers have been used to personify the movement, rustle and texture of the autumn leaves. At Explore Floor highlight the Trendy Luxury theme, British fashion house Debenhams and home grown brands iKarrtini and Mita Tam Style Studio showcased their latest collection. The multiple designers at Debenhams showcase the latest must-have trends and holiday essentials with elements of minimalism, 70s boho and a touch of the swinging 60s. 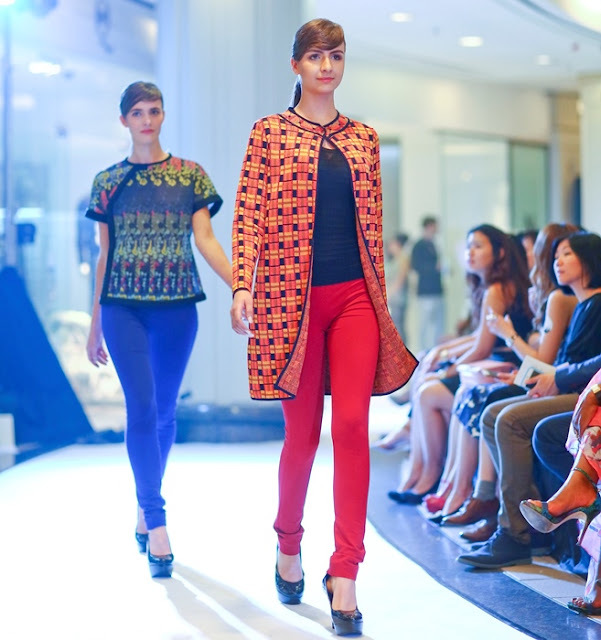 The stunning Autumn/Winter 2015 collection by iKarrtini showcases the beauty of Malaysia in its traditional-meets-contemporary ready-to-wear collection. ‘Colours of Autumn’ with green and brown coloured dresses for both casual and formal occasions were the highlights of the Autumn/Winter collection by Mita Tam Style Studio. Plus there were luxurious pop-up carts and Make Up For Ever provided a complimentary make over session. We received a Fashion Passport upon entry that enabled us for a lucky spin to win attractive prizes at the Wheel of Rewards such as shopping vouchers, hotel stays and beauty treatments whilst enjoying unlimited complimentary candy floss and popcorn en route. Love the dresses. The coats are so chic! What a glamorous event. Thanks for sharing these wonderful photos. so stylo mylo leh. kelly now one of the fashionista of high fashion d. i like! WAH! interesting style of runway fashion. Like how they utilize the small hall space they have. love the way how they made the runway concept a circle and all the guest seated left & right! At least can get a good view of these gorgeous designs! Bring me next time babe :P Fashion is my life! Explore Floor / Trendy Luxury Theme! II love the one in the middle!